There are many different kinds of surveys that can be performed. Boundary surveying is typically done for undeveloped land. This type of survey measures the actual physical extent of the property in question. Most surveys progress through the basic procedures regardless of the type being done. Any pertinent deeds, contracts, maps or other documents that contain a description of the property’s boundaries are located, studied and interpreted. A determination is made of what the actual property description is deemed to be, along with the locations of any physical evidence of the boundaries. This can be in the form of both natural and man-made monuments or markers that exist in the field. The property is then measured to establish the boundaries, not only using the appropriate existing monuments but with the creation and referencing of new markers where necessary. Measurements are accomplished using a total station and other surveying tools. 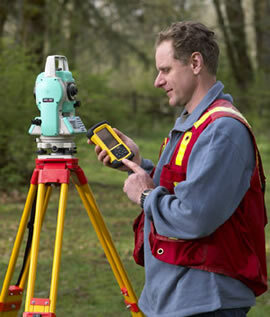 A total station measures both vertical and horizontal angles, as used in triangulation networks. After these steps are accomplished, the property description and plat are prepared. Interpreting the results of a land survey is not as difficult as it may first seem. For instance, a property plat will usually contain a directional orientation which is typically indicated with an arrow pointing north. It will contain the bearing and distance of each boundary line, the property lines of other properties shown on the plat, and the names of adjacent property owners listed in the areas of their property. Corner monuments, along with the names of any natural monuments (such as “Smith’s Creek”, for example) or a brief description of any unnamed natural monuments (such as the “30-inch pine tree”) are on the plat. There is also a title block containing the property’s location and name of owner, the surveyor’s name, the date the survey was performed, the scale of the plat and any other relevant data. Call Oxford Land Surveying today at 256-733-1733 or fill out a contact form requestfor more information concerning your land surveying needs.